This famed sanctuary is a nightmare for animals, two former employees say. The Sloth Sanctuary of Costa Rica is an internationally recognized rescue that says it dedicates itself to saving and rehabilitating lost or injured sloths. It's also a popular tourist destination and the source behind many of the internet's "cute sloth" videos - and was featured in Animal Planet's 2013 series "Meet the Sloths." But now two veterinarians who recently left the sanctuary are saying the so-called rescue is little more than a collection of sick and injured animals behind the scenes. "They say they work for conservation ... that's a complete lie," Dr. Camila Dunner, a veterinarian from Chile, told The Dodo. "We truly believe they kill animals [through neglect]." Dunner and her husband, Dr. Gabriel Pastor of Uruguay, moved to Costa Rica in May 2015 after being hired by the Sloth Sanctuary. Dunner said they had heard rumors the sanctuary was troubled behind the scenes, but hoped they could help the animals - and never thought it would be as bad as it was. "We still decided to give it a chance, because we thought it was the perfect opportunity to improve the quality of life for the animals," Dunner said. Once they arrived, it quickly became clear that the sanctuary was in trouble, she said. While most tourists see only a select group of sloths in the public display area, Dunner noted, the back was filled with around 200 sloths crammed into tiny cages as small as 2 feet wide. 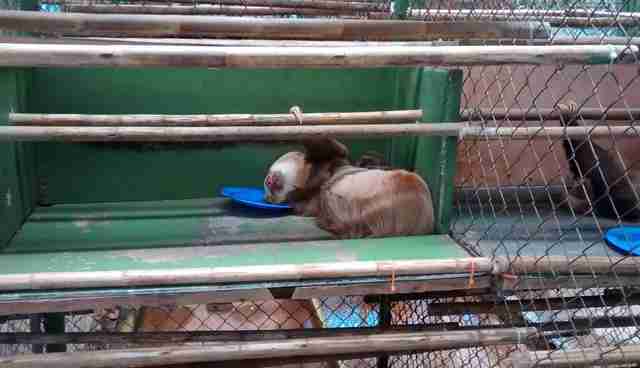 In some cases, the animals were kept together in the same cages, leading to often brutal injuries. "These are solitary animals but they are kept in pairs or up to four individuals per cage," Dunner said. "The ones that are lucky enough to be on their own are constantly fighting ... with their neighbor. 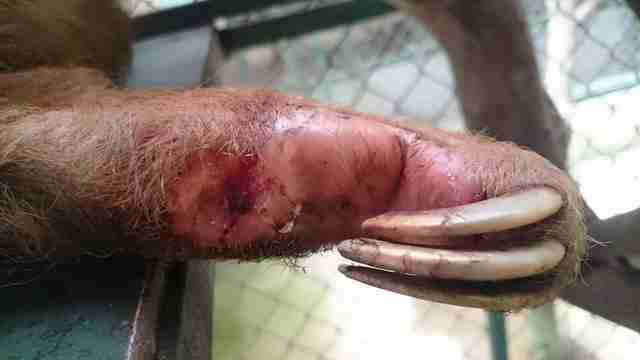 They can bite and pull an extremity through the fence, causing serious injuries." 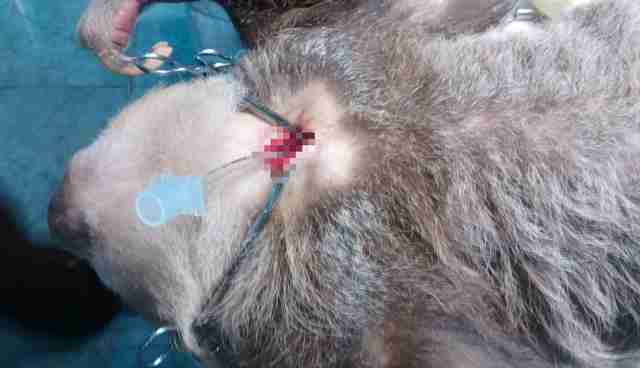 One graphic photo provided to The Dodo shows a sloth named Roxie whose scalp was ripped off her head. Despite the sanctuary's claims of rehabilitation, the majority of sloths were never released to the wild. Some were even "kidnapped" from their forest homes to be kept in captivity. Many were ill or injured from poor housing, inappropriate diet and a lack of veterinary attention, Dunner and Pastor allege. During their initial month-long trial period, Dunner and Pastor addressed their concerns with the owners. "They said they wanted a change," Dunner said. "They said they wanted someone with the knowledge and the know-how ... We saw a lot of opportunity there." Optimistic, and wanting to help the suffering animals, Dunner and Pastor agreed to stay on. But the owners' tune changed quickly after their decision. "We started seeing that everything we proposed they disagreed with," Dunner said. Gerald Richardson, an associate of the Sloth Sanctuary who handles media requests, declined to comment on the welfare allegations. He said it was up to Costa Rica's environmental agency Ministerio de Ambiente y Energia (MINAE) to govern the sanctuary, and that the Sloth Sanctuary didn't want to get involved in a "he said/she said situation." "The Sloth Sanctuary's mission, for over 25 years now, is caring for injured, orphaned and abandoned sloths - the animals' welfare is our greatest concern," he told The Dodo. "Perhaps you can one day plan a personal visit and take our Insider's Tour so you can see firsthand how rescued sloths are cared for." "It looks like a prison"
According to Dunner and Pastor, it quickly became clear that the Sloth Sanctuary had no intention of releasing its animals back into the wild - nearly every sloth taken in by the sanctuary gets jammed into the overcrowded cages in the private areas of the facility, they said. "She kept using this as a business," Dunner said of the founder, Judy Avey-Arroyo, who opened the sanctuary in 1992 with her late husband, Luis Arroyo. 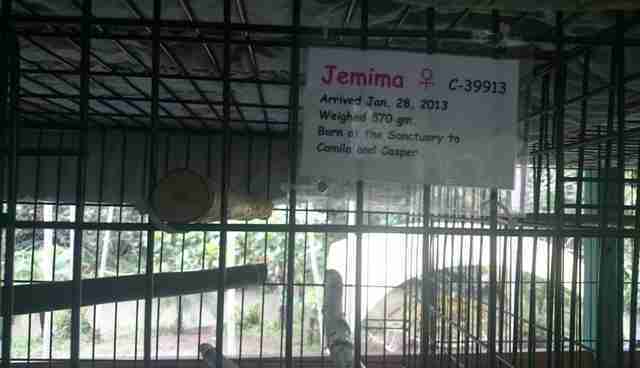 "Instead of ever trying to release an animal, she just started keeping them - letting people pet them, keeping them in tiny enclosures." "It's not even a center; it looks like a prison to us," Dunner said of the sanctuary. "Everyone thinks a sanctuary is better than a zoo. But a zoo is regulated ... [while] they do whatever they want." In addition to keeping nearly every sloth who came in, the owners took every opportunity to add more sloths to their collection, which bordered on a hoarding situation - often under the guise of protecting perfectly healthy wild animals from the "dangers" of the wild, according to Dunner. "These were healthy adults that were kidnapped from the wild and put in cages," she said. 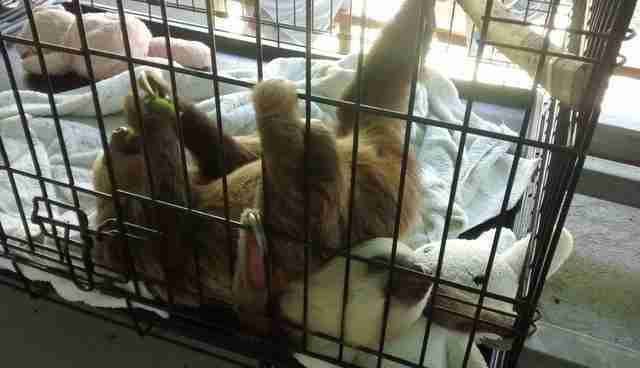 In one case, a sloth spotted crossing a road was brought to the sanctuary and locked up. Another fell from a tree and had no injuries, but was thrown into a cage as well. "These animals should have been released or translocated immediately - there was no excuse to keep them in captivity," Dunner said. "However, they were locked up and kept there until today." 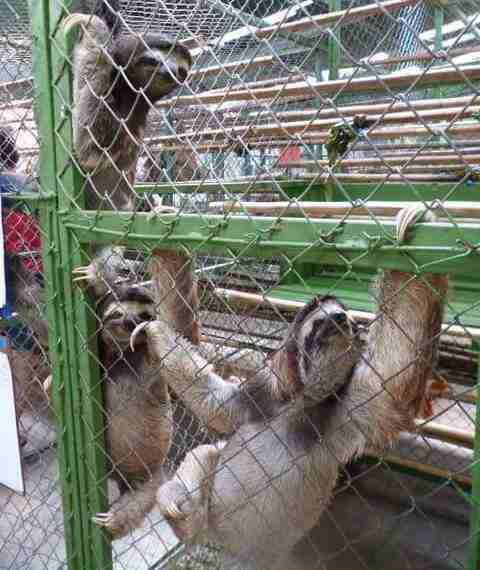 She noted that sloths can live up to 40 years and could spend decades in the undersized cages. "This can be considered an abduction or simply illegal capture of wildlife," she said. Since its founding, the sanctuary has taken in around 725 sloths but released only 41 rehabilitated animals, fewer than two per year, according to figures provided by Dunner. In a 2014 video, Avey-Arroyo says the sanctuary has released 122 sloths in its 20-plus year history, which would be about five per year - a still-low number that appears to be inflated by including sloths who were simply relocated by the sanctuary without being admitted. 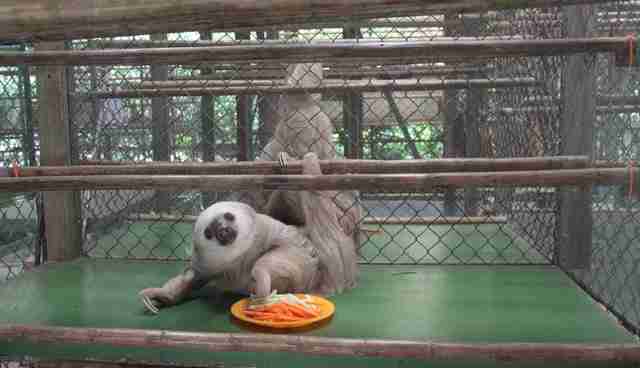 Yet of the 191 sloths who lived at the sanctuary in March, Dunner said, only 25 were non-releasable. One sloth named Delilah was taken into captivity after some children threw rocks at her, though she was healthy and uninjured. "She escaped at least four times ... during her life in the sanctuary and she was constantly recaptured," Dunner said. "One of those times she was eating on the top of a tree close to the cages and Judy sent the team again to cut down the tree (which is illegal also) to retrieve her, knowing the risk of death that the fall represented for Delilah." "She is still in captivity," Dunner said. "Her story is one of the saddest to me, it breaks my heart." 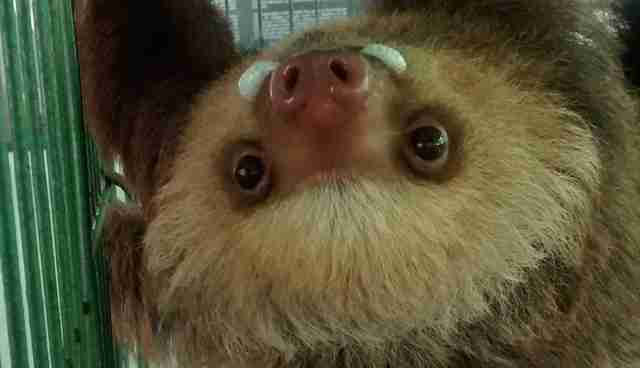 Another sloth named Holly Berry has also escaped into the forest several times and was repeatedly recaptured. "Keepers had to swim in the river that separates the forest from the sanctuary to retrieve him," Dunner said. On the rare occasion when animals were released, it wasn't always kind, Pastor and Dunner said. Nutmeg and her young baby, Cinnamon, were initially taken in after trying to cross a road, despite being perfectly healthy. When the Sloth Sanctuary decided to release an animal for a taping of the TV show "Ocean Mysteries With Jeff Corwin," Nutmeg was "separated by force" from Cinnamon and dropped back in the jungle without her infant, the vets said. The sanctuary kept her baby. "[It's] a constant desire to possess these animals," Dunner explained. Part of the problem, Dunner noted, is that the owners vastly underestimate the animals' capabilities. "Judy believes these animals don't have any instinct," she said. "She believes with all her strength that these animals will die in nature and prefers to keep them in a cage for life rather than giving them the chance." Despite the scores of sloths suffering from neglect, the Sloth Sanctuary's population is growing at around 13 percent per year, Dunner and Pastor estimated. The overcrowding has led to additional problems. Males and females were often kept in pairs, or in adjacent cages, which inevitably led to breeding. Dunner said she believes the dozen or so births she witnessed were illegal. Pregnancy stressed the already troubled animals even further, and some mothers miscarried or were involved in violent incidents with their babies. One mother, Stephanie, attacked and killed her baby, a young female named Venus, said Dunner, who provided photos of the autopsy to The Dodo. 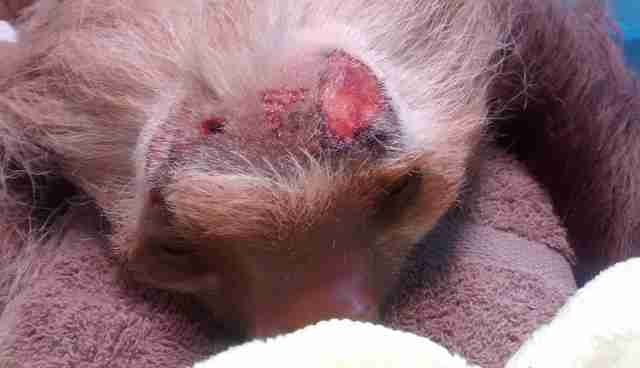 Another sloth, Peppa, was missing a leg - the sanctuary alternately told people that she had been bitten by a dog and had been caught in mesh. 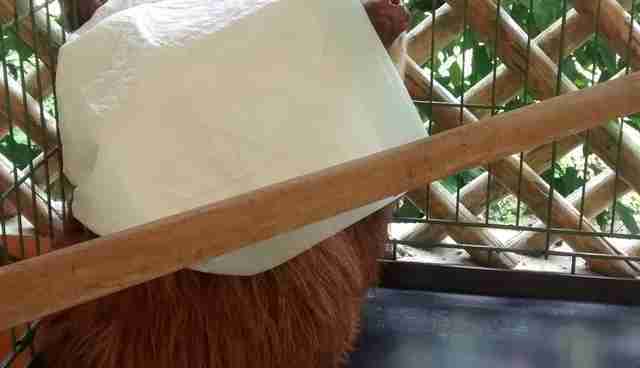 But Dunner and Pastor said they heard from a colleague that Peppa had actually been born into captivity and that her mother, Poppy, had eaten her leg off out of stress. When the couple tried to separate the animals to halt the breeding, Avey-Arroyo would try to stop them, saying the sloths would be sad, Dunner explained. She said Avey-Arroyo suggested they castrate the male sloths instead - though the procedure is illegal for the sloths, as they're Costa Rican wildlife. "They used to call these events as 'happy accidents,' which embarrassed us greatly, since each of those births could have been avoided, and it condemned those offspring into captivity [since the sanctuary wouldn't release them]," Dunner said. She added that the cluttered files found in the clinic showed that many sloths were pregnant and miscarried regularly. Babies born at the sanctuary had a hard road ahead. 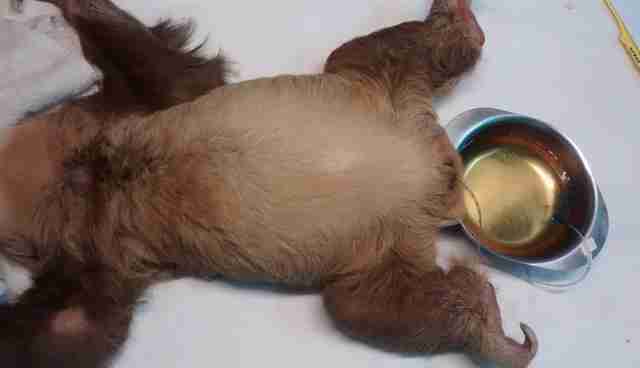 The infants were often kept in the neonatal intensive care unit (NICU) with juvenile sloths, though the two age groups had different needs. 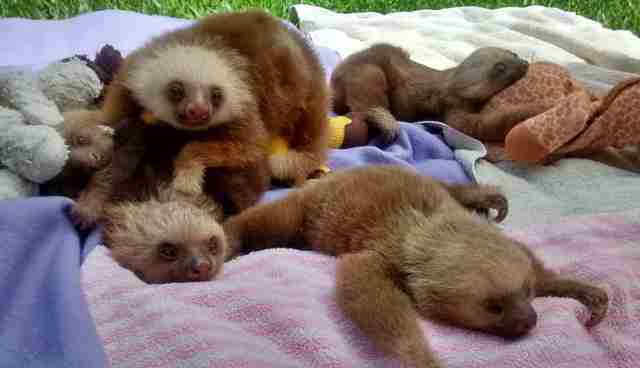 While the infant sloths needed to be feed every two hours, they were fed only when the juveniles were, four times a day. The starving young sloths would try to suckle on anything they could grab - stuffed animals, their own paws, their neighbors' fur. As a result, many of them developed jaw deformities. "This has led to numerous individuals presenting mandibular deformity, affecting lifelong growth of their teeth (malocclusion) and condemning them to captivity," Dunner said. And while young sloths in the wild would be learning to climb with their mothers, the babies at the Sloth Sanctuary spent their days in incubators filled with stuffed animals or storage boxes full of other sloths - a stressful situation for animals who are solitary by nature and live mostly in trees. If they were lucky, Dunner said, they would get 30 minutes or so of exercise on an old jungle gym per day. While Dunner and Pastor had expected to spend their time helping sloths who were injured in the wild, they ended up having to focus on the animals who had been injured due to the sanctuary's neglect, they said. For one, the sanctuary kept all the sloths on an improper diet of cooked and raw vegetables, instead of the leaf-based diet they'd eat in the wild. As a result, many sloths developed malabsorption syndrome, which led to malnutrition and, in severe cases, sudden death, the vets explained. It also damaged their digestive systems. Dunner and Pastor treated many sloths for severe constipation or an inability to pass urine, which would lead to painful, distended stomachs as the waste built up inside of them. "This was one of the most common problems we treated," Dunner said. The abnormally soft diet would also stick to the mouths of the animals and cut off their air supply, Dunner said, leading to emergency tracheostomies in some cases. 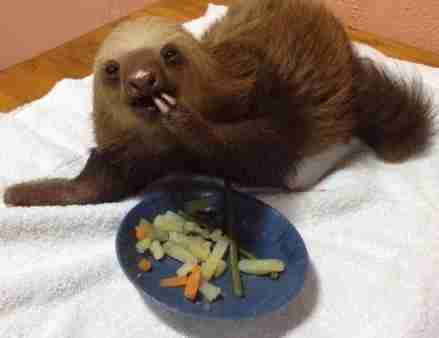 The vegetables were also too soft for the sloths' constantly growing teeth. "Teeth cannot be worn down if a proper diet is not offered; they were born to eat leaves and not vegetables," Dunner explained. As a result, many of the neglected animals had dental disease and overgrown canines, which in some cases would slice right through their mouths. Dunner and Pastor said they tried to change the sloths' diets, but were often stopped by Avey-Arroyo, who continually made excuses, at one point falsely claiming that it was pointless since no one even knew what sloths ate in the wild. "There are scientific publications about it [sloth diets] that the founder knows but does not trust," Dunner explained. The Dodo reached out to Tinka Plese, a Croatian sloth expert and founder of the AIUNAU Foundation, a Colombian rehabilitation group that works with sloths, who confirmed that captive sloths need a natural diet to thrive. "Nobody chops the food, serves them in plates in the canopy of the forest, and then stores them in cages [in the wild]," she said. "If you are really a rehabilitator, in each moment, you try to do your best to give natural conditions for animals you care of in order to return them in the wild." Once they reached adulthood, the sloths were usually taken off display and sent to spend the next few decades of their lives in the behind-the-scenes cages, which allowed no room for proper climbing or a natural lifestyle. "Adults are doomed to live in these enclosures; they are not taken out nor exposed to sun or rain," Dunner said. "[They are] bored, with just parallel perches, in tiny cages ... some of them even eat on their bellies, completely abnormal behavior." 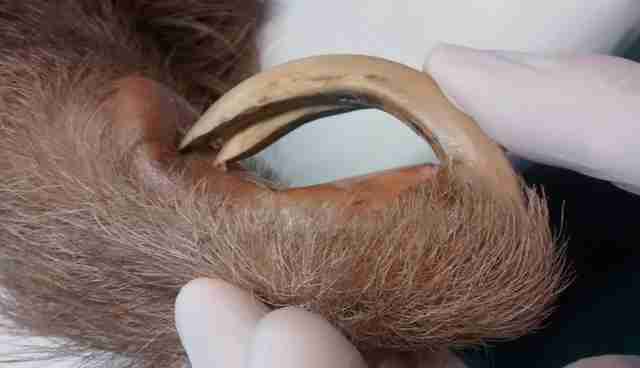 As the sloths spent years in their tiny cages and had no real opportunities to climb, their nails would sometimes grow so long they would curve back around and pierce the sloths' flesh. "We lost a lot of our time taking care of self-inflicted injuries," Dunner explained. "We had nails overgrow that would perforate the palms of the animals." 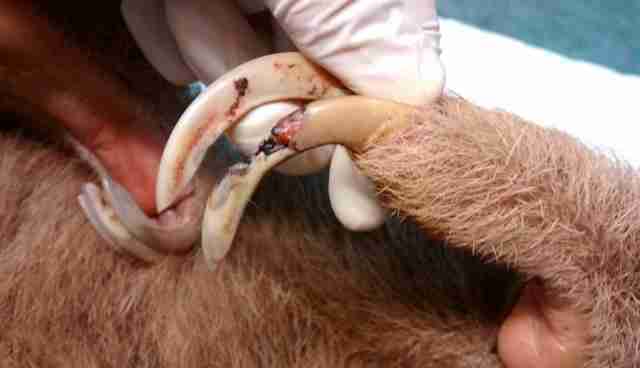 The couple also frequently treated sloths who had injuries from fighting, including shattered nails, lacerations, bites, infections and abscesses. The sloths also developed strange psychological behavior, such as trying to hide under blankets and anything else they could find, and refusing to defecate, as a result of the small cages and lack of privacy. A number of sloths suffered from tapeworms and other parasites. 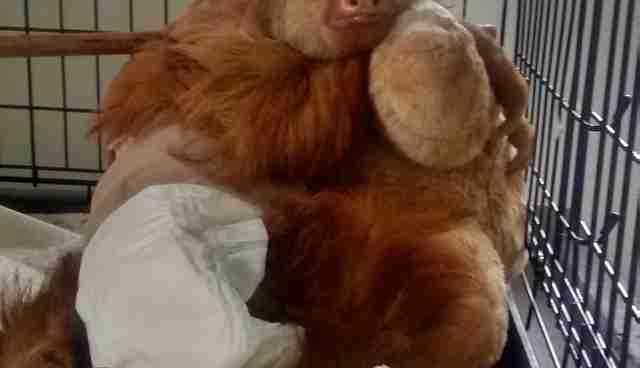 Despite the health problems and the gruesome injuries many of the sloths had, the sanctuary apparently had little interest in getting them medical care. "They had like five veterinarians in 20 years, and they spent a long time without a veterinarian," Dunner said. Ubu was one of the victims of medical neglect. When Dunner and Pastor first arrived, they found him partially paralyzed. He was covered in pressure sores from the lack of climbing, was unable to control his urine and had a likely infection. He had begun trying to chew off his own back legs because he couldn't feel them. Dunner and Pastor had little choice but to euthanize him. "He lived for six years almost unattended, dragging his body, causing the pressure ulcers ... [and] urinating and defecating over himself," Dunner said. "He was miserable. It took us so long to make Judy understand that keeping him alive was selfish and unethical." Another sloth named Lucy developed severe pressure sores, Dunner and Pastor said, because she spent all day on the same wooden pole due to harassment from the other sloths. During the periods without a staff vet, Dunner and Pastor said, Avey-Arroyo and her family became used to treating the animals themselves - despite a total lack of medical knowledge. "They do it themselves," Dunner noted, explaining that the owner would often overrule her and Pastor or prevent them from treating the animals, leading to illness and even death. Dunner said there were multiple cases where Avey-Arroyo would give the wrong medication or overdose a sloth. "They give 10 times the dose for a baby animal," she said. "They're playing at doctor." 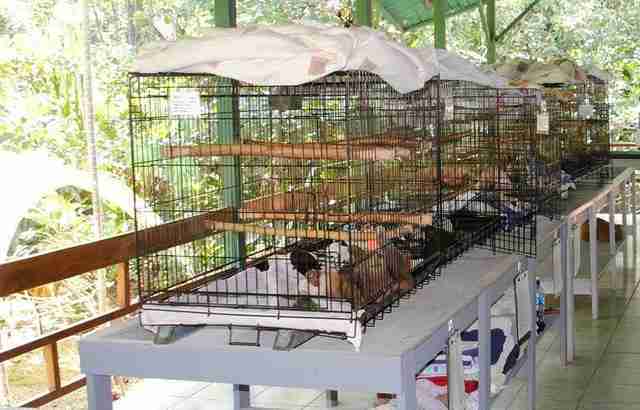 In other cases, it appears the sanctuary owners would refuse veterinary care to some of the animals. On one of Dunner's first days on the job, she said, she and her husband performed a necropsy of a sloth they found dead in a cardboard box - they were told that Avey-Arroyo had refused to take him to a vet after he'd begun having seizures a few days before and had told a staffer to just leave him in the box, where he presumably died. "We did the necropsy and found a head trauma that nobody could ever explain," Dunner said. Dunner said she and her husband were unable to catch up on the years of neglect despite their efforts. "In this year, we both were unable to check all the residents because you need to keep up with all the emergencies and the babies and the feeding," she explained. "They have too many animals that they cannot take care of." 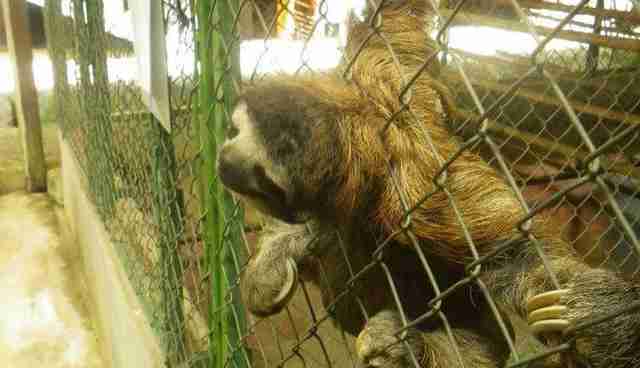 Some sloths went up to six years without receiving veterinary treatment, Dunner added. "If you know there's no way you can pay for extra vets to take care of 200 animals, you should not have 200 animals," she said. "The solution that Judy puts for that is just building more cages." "None of that money goes to the sloths"
Of course, the animal welfare concerns were a priority for the veterinarians. But they had concerns about other aspects of the sanctuary as well, such as the tours. "These animals are raised virtually as pets, with close physical contact (hugs and kisses on their faces, as you can Google), unhygienic practices and delivering a contradictory message," Dunner explained. "It is impossible to educate the public about respect for a wild animal if they are treated like a puppy, which also promotes the illegal trade in these species as pets." Dunner said that the sanctuary would also tell visitors blatant lies about sloth biology, including that they have reptilian biology, that they can regenerate limbs and that young sloths cannot be raised to be released to the wild. But there's one thing Dunner said the sanctuary was very good at: fundraising. The Sloth Sanctuary has an active social media presence and frequently uses the sloths to raise money. "They will brag about how they got $10,000," Dunner said. "They would come to us and say, 'Ah, we have so much money.' 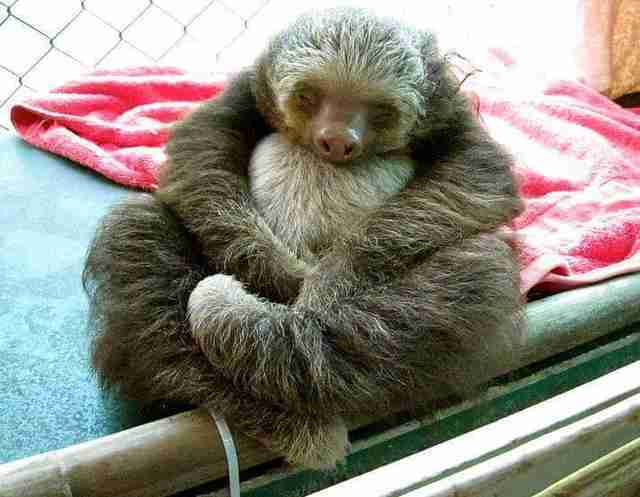 But none of that money goes to the sloths." "They use the money for anything else," she added, noting she believes the sanctuary is run to generate business income for the family. "None of them [the sloths] get proper diets, none of them get proper enclosures - we had to euthanize, it's too much [for them]." This isn't the first time the Sloth Sanctuary has been accused of welfare issues. A woman who claimed to be a former volunteer accused the sanctuary of neglect in a 2012 personal blog post, which has since been deleted. She mirrored many of Dunner and Pastor's concerns, saying the sanctuary did not release the sloths and that many of them had parasites. She also mentioned the sloth named Ubu and described him as suffering and paralyzed - a full three years before Dunner and Pastor put him to sleep. As a condition of accepting the job, Dunner and Pastor requested that the sanctuary release some of the sloths back into the forest. The owners agreed. But Dunner said none of the sloths were actually released. "[The] Facebook posts are a blatant lie," Dunner said. " 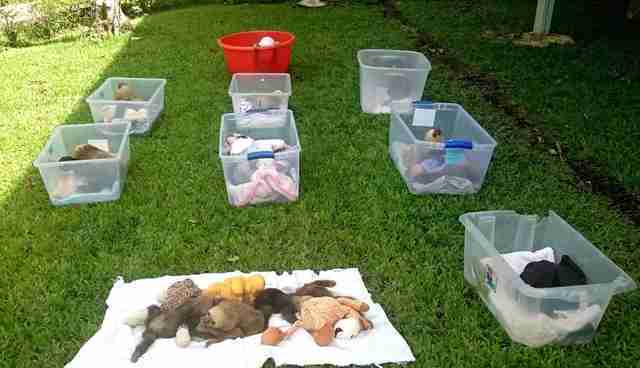 None of the infants displayed on Facebook ... will be released, unless the Costa Rican authorities take over." The Sloth Sanctuary's own website backs up many of Dunner and Pastor's claims. Despite mentioning upcoming release efforts on social media and in fundraising campaigns, the Sloth Sanctuary says several times on its website that the sloths it takes in cannot be released to the wild - a claim Avey-Arroyo often used to justify keeping the sloths in captivity, Dunner and Pastor said. But that claim is patently false, according to Plese, the sloth expert. In addition to working as a rehabilitator, Plese is also a member of the International Union for Conservation of Nature's Species Survival Commission (IUCN/SSC) Anteater, Sloth & Armadillo Specialist Group. Plese told The Dodo that, just like nearly any other wild animal, rescued sloths, even infants, can be rehabilitated and returned to the wild if they're cared for by professionals. "If a rescue center manages to attend [to] them properly ... then they can undergo a process of rehabilitation according to their age: newborn, infant, adolescent, adult, adults recently taken from the forest or adults that spend [a] long time in captivity," she said. However, when sloths are treated like pets or are unable to engage in natural behaviors - as is the case at the Sloth Sanctuary - they're prevented from developing the independence they need to survive. "If you keep them in cages, chop the food for them, offer them whatever food without respecting their biology and ecology, you will not manage to successfully rehabilitate them," she said. Plese also noted that she's had her own run-in with Avey-Arroyo. During the filming of "Meet the Sloths," the 2013 series that heavily featured the Sloth Sanctuary, Plese was interviewed about her track record of successful rehabilitation and released some rescued sloths on camera. Her scenes were cut from the show, she said, and she later heard Avey-Arroyo had blocked them from being included, presumably because they would undo the Sloth Sanctuary's narrative about the impossibility of returning its sloths to the wild. 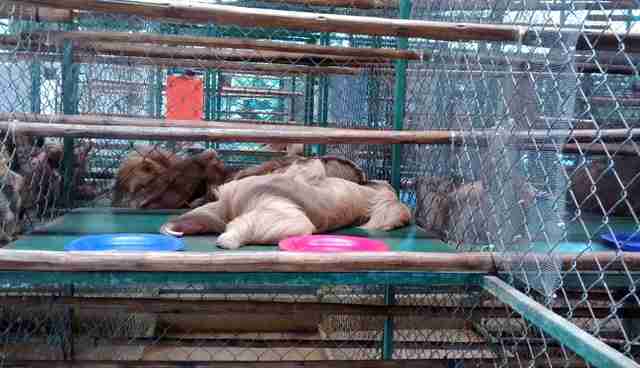 Plese said she has heard horror stories from former volunteers and workers who have contacted her out of concern after seeing the Sloth Sanctuary's conditions. "Just about everybody coincides about them: animal exploitation ... animal mistreatment, total disrespect towards sloths, manipulation of the general public [and] using ignorance of people towards wild fauna for her benefit," she said. When asked for her professional opinion of the Sloth Sanctuary, Plese was direct. "Very straight answer," she said. "I would close the facility right now and put ... [Avey-Arroyo] in jail." Gerald Richardson's presence at the sanctuary is more than just happenstance. According to the veterinarians, he is also the brother of Daryl Richardson, owner of Texas' Dallas World Aquarium (DWA), which has been criticized for being run more like a personal menagerie of threatened and endangered animals, in many cases wild-caught, than a conservation-minded facility. DWA has had a partnership with the Sloth Sanctuary for years - a partnership that seems to have sparked a strange symbiotic relationship between the two groups. Daryl Richardson has even imported some of the sanctuary's "rescued" sloths to round out his collection at DWA, rather than facilitating their release to the wild. A 2015 New Republic article says DWA imported six sloths from the sanctuary - three sloths still lived at DWA at the time the article was published, and Richardson refused to comment on the whereabouts of the others. Dunner said she found records of at least nine sloths who had been given to DWA since 1998. None of the sloths' files had necessary documentation such as health information and export permits, Dunner said, and she's uncertain if the sanctuary has it elsewhere. She said she believes some of them didn't survive the trip. The Sloth Sanctuary also assisted in Daryl Richardson's extremely controversial Panama expedition in 2013, when he captured six highly endangered pygmy sloths from the wild and, with Avey-Arroyo by his side, attempted to fly them back to Texas. He was halted by a literal mob at the airport, which reportedly stepped in to protect the sloths from Richardson and his team - it's still unclear if DWA's documentation was valid, and the attempt was criticized by conservationists and zoologists around the world. Conservationists later returned the kidnapped sloths to the wild. Watching the suffering eventually became too much for Dunner and Pastor, and they decided to leave the sanctuary several months ago after presenting a plan for releasing the sloths - a plan that management ignored. They gave several months' notice. However, during their resignation process, they noticed the sanctuary and DWA had copied their proposal and posted it online without crediting them - instead attributing it to DWA. Dunner and Pastor described it as "selling [it] to the public" - in other words, using the proposal to fundraise and continue the sanctuary's narrative of conservation and release without following through on it. When the veterinarians contacted management to discuss using the proposal, Richardson informed them it was their last day at the sanctuary and that they were being kicked out of their house, which was on the grounds. They were blocked from finishing research that Avey-Arroyo had signed off on, Dunner and Pastor said, and faced a string of threats and personal attacks. Though Dunner and Pastor have been speaking with The Dodo for more than a month, they requested that their story be withheld until they could safely leave the country due to concern about the threats they received. Their story doesn't appear to be unique. Though there are other accounts of volunteers, former workers and guests who had similar experiences with the Sloth Sanctuary, The Dodo was unable to find someone to speak on the record, due to fear of retribution. Now Dunner and Pastor, who also sent their account to MINAE, are left wondering what more they could have done for the sloths in their care, and are hoping their story will inspire the public to not support sanctuaries where "sentimentality ... and business are prioritized, rather than the welfare of the animals." "We came here with the expectation of staying here for 10 years, maybe for life, because they gave us those fake hopes," Dunner said, later adding: "We can say with certainty that the Sloth Sanctuary of Costa Rica is not making any real conservation efforts." "It's just inhumane," she said.